Thanks to 37,000 Care2 members taking action, the more than one million pregnant pigs on Canadian farms will not have to spend their lives confined in a space so small they can’t even turn around. A Care2 petition demanded an urgent response to help mother pigs — and Canada’s National Farm Animal Care Council and the Canadian Pork Council have created new regulations that ban the continuous confinement of sows in newly built and rebuilt facilities. A new Code of Practice for the Care and Handling of Pigs has just been released. Significantly, the new Code of Practice includes a long-overdue ban on continuously confining pregnant sows in gestation crates which, in an age of industrial-scale farming, have become a standard practice in North America. Facilities that are built or renovated after July 1, 2014 must now have group housing systems for pregnant sows, instead of keeping them in crates barely bigger than their own bodies. Pig producers, animal welfare and enforcement representatives, researchers, transporters, processors, veterinarians and government representatives all worked in close consultation with a Scientific Committee (with specific expertise in pig behavior, health and welfare) to create Canada’s new regulations. In addition to calling for a ban on gestation crates, the new Code of Practice requires mandatory pain relief for pigs during castration and tail docking. There’s no question that pigs kept in gestation crates suffer horrifically in conditions that would be considered torture for human beings. 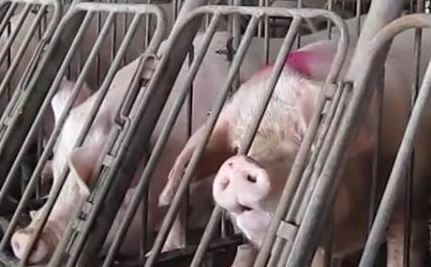 The crates simply aren’t necessary to raise pigs. For generations, family farms have been raising these intelligent and social animals without crates. Recognizing all this, nine U.S. states and the European Union have already passed legislation banning the continual confinement of breeding pigs. Major U.S. pork producers including Smithfield, Hormel, Tyson, Olymel and Maple Leaf Foods have been moving away from using gestation crates. The vast majority of Canadians (84 percent in a recent national poll) oppose the use of the crates. As Sayara Thurston, campaign manager with Humane Society International (HSI)/Canada, says, the new Code of Practice is a “monumental first step.” Nonetheless, she also makes it clear that much remains to be done to “improve the welfare of pigs raised on Canadian farms.” In particular, it must be emphasized that the new Code only applies to code applies to farms that will be built and rebuilt after July 1, 2014. Only a small number of stalls will actually be built under the guidelines laid out by the new Code. As Barbara Cartwright, CEO of the Canadian Federation of Humane Societies, observes, ”even higher standards” than those in the new Code of Practice are needed to ensure the welfare of pigs. It’s a huge step forward that pregnant pigs on Canadian farms won’t have to spend their lives in cramped surroundings and you helped to make it happen. There are still many more ways that Canada’s pork industry could improve the lives of pigs – we need to keep up the pressure on Canada’s National Farm Animal Care Council and the Pork Council for the sake of all pigs. There are still plenty of reasons to take action on behalf of thousands of animals, in Canada and elsewhere. You can also start your own Care2 petition to make a difference. Humans are constantly evolving. As part of our conscious evolution, it is time to stop behaving as though we own the rest of the animals in the world. Thank you for helping to put an end to these practices and help humanity move forward toward a more compassionate future. Let's hope the United States follow their lead on this!! First in order, a big thank you to Canada and the others who have educated themselves and weighed in on the moral side of how we treat animals. Suffering is worse than death. Hopefully, as more countries and companies see that it is possible to do the right thing and lead by example others will follow. The subject of cruelty to farm/factory animals, thank God, is coming under the microscope and to the public's attention. You do not have to be vegetarian to appreciate that if you want meat on the table, when the animal gives up it's last breath to feed man, the poor soul at least deserves to have compassion before the journey ends. All it takes is a heart to know suffering, pain is what we fear more than death, do you think just because the poor animal can't speak, that it's any less painful for them? If they give their life while they still have the breath of life in them, do the Godly thing, do the right thing, treat them with compassion. Though I do not eat meat my family does, that is a personal choice for each, but one thing we all agree on...our money will not support a farm or animal factory or lender or anyone who contributes toward cruelty to animals! I guess this one slipped by Harper. He advocates clubbing baby seals, wildlife bloodbaths, clearcutting forests, import of dog meat, slaughter of pet horses, filhy tar sands destruction of the world, you name it. Harper would definitely be all for the torture of farm animals and small children. This is an awesome step forward!